A new report, ‘Stitching Our Shoes’, launched today, on International Womens Day, by campaigning groups Labour Behind the Label and Homeworkers Worldwide, uncovers the reality of exploitation in the supply chains of many leather shoes sold on our high streets. The UK is one of the largest footwear markets in the world, with each person in the UK buying, on average, five pairs of shoes per year. New research has found that homeworkers, an invisible workforce of women earning poverty wages in precarious employment, form a key part of the leather shoe supply chain. 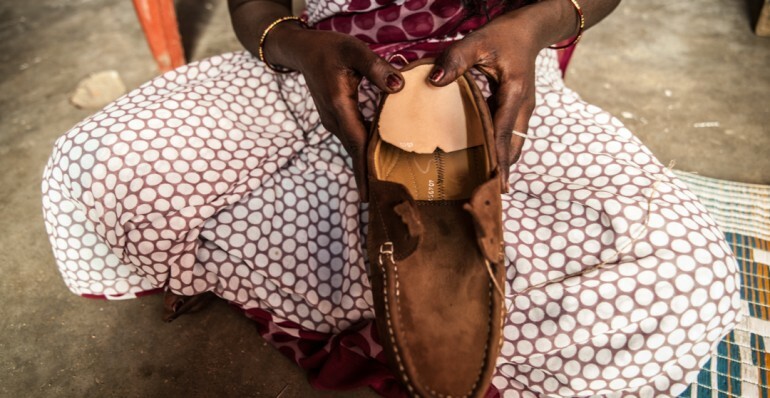 There are thousands of women homeworkers in the Indian leather shoe sector alone. These women, often married with young children or elderly parents to look after, mainly stitch the uppers of shoes, one of the most back-breaking and labour-intensive parts of production. 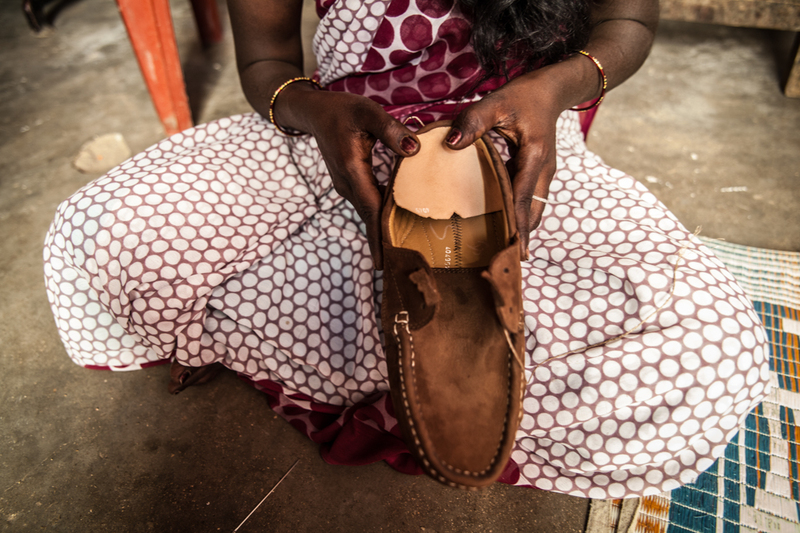 In Ambur, Tamil Nadu, India, homeworkers typically earn less than 10 pence for each pair of leather uppers they hand-stitch, which are sometimes sold by British brands for over £100 per pair. This is well under a minimum wage, let alone a living wage. With no health insurance or benefits afforded to their factory counterparts, this pay does not allow for the medical attention necessary to deal with regular health complaints such as skin rashes from the chemicals used in leather tanning, numbness in the hands, back pain and eye strain. “We have nothing. That’s why we know this is employer exploitation. We have no other way. That’s why we are involved in this work” Shanti, a homeworker from Tamil Nadu region in India. These are invisible workers, employed directly by factory middlemen without contracts or any legal or social protection. They provide both the low-cost labour and the flexibility that is so sought after by UK shoe brands. “Today we may earn 50 rupees but there is no guarantee that we will have an income tomorrow. Those who work in the company have some guarantee for work but we don’t. There is no job security” Sumitra, a shoe homeworker earning 7 pence per pair of leather shoe uppers she stitches. and tracing the origin of a pair of shoes back to the workers who made them is virtually impossible due to complex global supply chains and a near-total lack of transparency in the industry. “Homeworkers provide extremely cheap and flexible labour which suits shoe brands looking to maximise their profits, but is nothing short of exploitation. We need transparency in the industry to ensure the rights of homeworkers are respected and they are paid a living wage. Brands need to recognise homeworkers as part of their supply chains and publish their social audits and due diligence efforts, particularly in regards to treatment of homeworkers, instead of denying all knowledge or responsibility” said Ilana Winterstein, Communications Director for Labour Behind the Label. 2. Labour Behind the Label campaigns for garment workers’ rights worldwide. Labour Behind the Label represent the Clean Clothes Campaign (CCC) in the UK. The CCC works to improve conditions and support the empowerment of workers in the global garment industry. The CCC has national campaigns in 15 European countries with a network of 250 organisations worldwide. strengthened regulation to better protect homeworkers. 4. Change Your Shoes is a partnership of 15 European and 3 Asian organisations. We believe that workers in the shoe supply chain have a right to a living wage and to safe working conditions, and that consumers have a right to safe products and transparency in the production of their shoes.